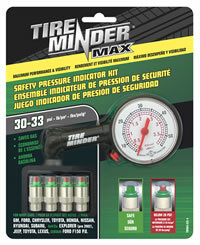 The revolutionary Tire Minder� Safety Pressure Indicator eliminates the guesswork of determining correct tire pressure. Proper inflation of your tires helps reduce the risk of poor handling, blowouts and accidents while improving gas mileage and tire life. These easy to install replacement valve caps constantly monitor your tire pressure with clear, bright color indicators. Tire Minder Max� is constructed of chrome plated brass and polycarbonate for maximum durability. Kit comes with 4 tire pressure monitors and a tire pressure gauge.